The building has a large historical importance in the village of Taynuilt. It originally opened as Robin’s Nest Tea Room in 1940 and remained a prominent feature of village life, becoming the doctor’s surgery in the 50’s until the mid 70’s. 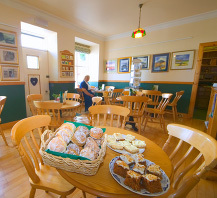 The tea room was re-established in 1996 under the ownership of Mairead and Murray Sim and embraces a lot of the tradition and history of the original Robin’s Nest but maintains its own identity with local arts and craft products available for sale. For more information about what we can offer to you, please do not hesitate to get in touch with us. You can contact us by calling the number on this website, or email and a member of our team will respond as soon as possible. We are open 4 Days (Thu – Sun) 10am to 4.30pm.